Best long-term communications strategy? Be who you are. Years ago, when there were still Volkswagen beetles on the road, I saw one on which someone had installed a Mercedes hood. It made me laugh, but the image has stayed with me, because it strikes the balance we all need as we brand and communicate ourselves and our businesses. The guy wasn’t trying to be somebody he wasn’t. But he was signaling the world that he intended to be something bigger. I never actually met the owner, but I wouldn’t be surprised if he ended up driving a real Mercedes. Most of us face tough choices in communicating our businesses, but my most reliable guide over the years has been a bit of advice I got from my dad as a kid: Be who you are. We want to present our best face to the world, but it still has to be our face, or we may regret it later. It’s not an easy principle to follow. We see a piece of business that would really put us on the map, and we worry that “who we are” won’t be enough to get it. We’re tempted to reinvent ourselves, even if that means turning away from what’s always worked. Don’t get me wrong: I’m all for evolving, growing, and updating our image. But I’ve learned over time (sometimes the hard way) that the best way to build an identity is to make sure it reflects the reality. Know who you are. Step back and get the big picture to understand what you do best, how you’re perceived, what works for you and what doesn’t. Being an SEC football fan, I’ve enjoyed watching the rivalry in recent years between LSU Coach Les Miles and Alabama Coach Nick Saban. Between them, they’ve won three out of the last five national championships. But their styles differ markedly. Miles earned his nickname of the “Mad Hatter” because he loves to run trick plays and flake kicks. He’s good at it, too. 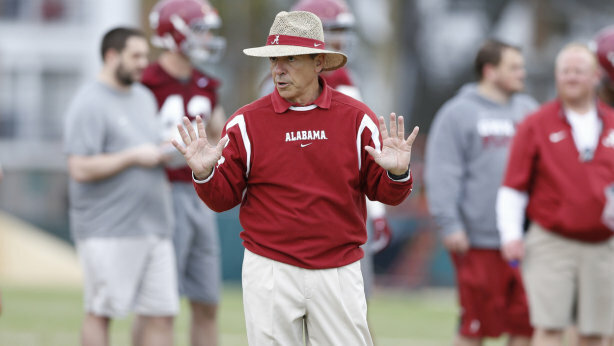 Saban, on the other hand, has little patience with that sort of thing. He’d rather have his guys run straight at you, and when he tries a gadget play, it frequently has a tragic outcome (though a nifty onside kick helped him win a national championship in 2015). Two great coaches, each doing what he does best, and winning a lot of football games by being who he is. Don’t fake it. I’ve never seen a company prosper over the long run by misrepresenting itself. (I’ve seen quite a few make a big splash and vanish into thin air.) Folks do some funny things to try to match the swagger of a competitor. I’ve seen them rent fancy cars (locally) and hire temporary workers to look busy when a prospect is coming to visit. I even knew of one who chartered an airplane just so he could say he “flew private.” Give your prospective seller a little credit. If he sees through the fakery, you’re probably dead in the water. On the other hand, if you’re up-front about your track record and resources, he may be just wise enough to take that into account. Don’t let your reach exceed your grasp. You don’t want to end up looking like a cocker spaniel that’s caught himself a truck, so don’t promote capabilities you don’t have. If you’re going after a piece of work and you’re not really sure you can pull it off, consider letting somebody else have it. But if you’ve done the homework and you’re sure you’re up to the task, don’t be afraid to step up in class and go for it. Don’t worry too much about your competitor. Of all the mistakes I’ve seen — and made — one of the easiest is to get off the playbook by overreacting to what we perceive as a competitor’s advantage. When we do that, we’re letting the competitor dictate the rules of the game, and that’s a good way to lose. Play your game, and let him play his. If you’re better, you’ll win more often than not. Make a commitment. Expand the “be who you are” principle to your entire business, even beyond your communication. If “flash and dash” is your style, don’t try to be the buttoned-down executive type. By contrast, if your success comes from low-key hard work, make sure your brochures, web site and proposals reflect that. If who you really are isn’t enough to sell the prospect, he’s probably not going to be happy with you anyway, and you’re better off moving on to more fertile ground. Adapted from a column originally published in December 2012 Auctioneer magazine, Copyright 2012 National Auctioneers Association, used by permission.